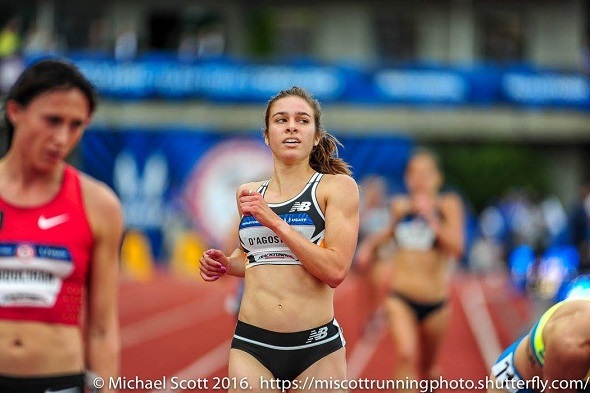 Back in 2012, Dartmouth junior Abbey D’Agostino came within 0.19 seconds of making Team USA in the women’s 5,000m. This year, she was hoping to not come that close to missing out again, despite the fact she had a late start to her outdoor season due to a stress fracture after the indoor season. In the women’s 5,000m final this year, the field went out on 16:00 finishing pace that was being led out by Molly Huddle and Emily Infeld – both who already made the Olympic team in the 10km. D’Agostino was close to the front as she sat in the 5th/6th position. She remained here as the pace slowly picked up, ultimately making it down to 15:10 by the time they had one mile to go. At this point, the field began to separate and D’Agostino was among the back of that breakaway group. She didn’t give up though – at the bell, she was in sixth and began to charge along the edge of lane 1, passing one athlete and trying her best to pass Infeld. Infeld would not give up though as she remained a half of a step ahead of D’Agostino for the final 150m and held on for fourth place while D’Agostino got a repeat of fifth in 15:14.04. D’Agostino has a VERY slim chance of going to Rio – Huddle held on to win the race, and with her and Infeld already making the team in the 10km, they could opt to focus only on the 10km and not do the double. But if one of those two decide to do the double, D’Agostino’s Olympic dreams are on hold for another four years. Morgan Uceny (Cornell ’07) was a dark horse on making her second Olympic team in the 1,500m. Her 2016 outdoor form was looking similar to what she was showing back in 2012 when she won the national title and was in Olympic medal contention. Uceny started off near the back but she moved up on the second to last lap, sitting in third at the bell. With 200m to go, Uceny was in second place and it appeared that her strong finish could help her remain in the top 3. But in the final 100m she could not keep up as three athletes passed her and her Olympic dreams died as her legs did. Uceny finished in fifth place in 4:06.94 as Simpson claimed the national title and Shannon Rowbury and Brenda Martinez rounded out the 1,500m team. This entry was posted on Sunday, July 10th, 2016 at 7:09 pm. It is filed under Olympics, Spotlight. You can follow any responses to this entry through the RSS 2.0 feed.